Start reading The Dead Shall Live today! “Mere moments ago I finished The Dead Shall Live in a tumult of emotion, the primary one is “I can’t believe it is better than This Crumbling Pageant” I truly can’t believe it, but so it is. Of course, I hardly know how to write this review without spoilers because the dead who lived is not really the dead I expected to live, but know that that person is living, I see where the clues led. I mean, before that dead person actually drew breath, I had it figured out, but throughout the reading, I didn’t put them together until near the end. Another aspect I am not sure how to write about without giving away too much is that there is a sub-theme of redemption. Some who we may think despicable may not be quite as awful as we thought and some who we though quite delightful just might not seems that way now. Persephone has depths we could never have imagined. “This is a staggering novel that kept me up late every single night until I finished reading – a masterful blending of fantasy, mystery, and romance. And if you’re a sucker for romance like I am, you will not be disappointed. I am putty in the hands of an author who can portray a protagonist whose journey checks off all my boxes. Give me a man from a family cursed with poverty that brings about neglect of all his needs, emotional as well as physical. Let him have a past in which he does things, both good and bad, for ignoble reasons. Now, give him an epiphany of understanding that drives him to do the right things for his people, regardless of the consequences for him personally. Have him deny himself any solace as self-imposed punishment for his sins. Now bring in a woman who sees through to the core of him and chooses him anyway. Chooses him over and over again, regardless of who asks the question. Persephone is a mighty heroine, acknowledged by all – even her impossible husband – as the most powerful magician in recent memory. As a child she had an insatiable drive to learn. As a woman, she is able to channel that learning into finding the full meaning of the prophecy that drives the Earthborn rebellion. I waited for what felt like forever for this book to be published. It is the second book in the Fury Triad, preceded by This Crumbling Pageant. There is a different feel to this book, in that it has a somewhat narrower focus. The first book immersed me in the world-building of the Regency-era Magi and specifically, the role Persephone plays in the struggle to crown the True King of Magi England. The Dead Shall Live focuses on Persephone and the Earthborn rebels – on what they must do to survive to fight another day. Persephone, with the help of her difficult husband, Vespasian Wyllt, has decimated the entire army of the pretender to the throne, but in spite of her best efforts, the pretender survives. The Dead Shall Live begins exactly where This Crumbling Pageant ended. Literally in the same scene. The Earthborn have lived with the prophecy of the coming of the True King for a long time. As The Dead Shall Live opens, their Seer has just named Robin Fitzwilliam, Persephone’s erstwhile fiance, as the True King. It is no surprise that Vespasian utterly rejects the proclamation, but he is a bit surprised when Persephone repudiates it as well. She knows Robin is too weak to be their king. Persephone has loved Robin since she was thirteen years old, but she is a married woman now. Robin and all the Fury family believe that she was kidnapped and forced into marriage with Vespasian, but Persephone is quick to contradict that notion every time it’s expressed. Vociferously. She didn’t marry for love, and virtually no kindness exists between her and Vespasian, but she chooses to align herself with the Earthborn and their leader, her wretched husband. This book takes us from Wales and the sacred grove where the Earthborn sheltered, to a wooden-masted ship sailing the Irish Sea, to the town of Youghal in Ireland. Throughout the journey, we watch the dance between Persephone and Vespasian. Both are too intelligent and learned to be understood by anyone else. Both have deep resentment toward the other for a variety of reasons. But both have also experienced the stupendous power they wield when they blend their magic together. Award-winning screenwriter & novelist Patricia Burroughs loves Pratchett, Aaronovitch, Dunnett, and Heyer. She and her husband live in Dallas, Texas. Patricia Burroughs—Pooks—began her writing career in romance with five published novels. She received nominations and recognition from RT Reviews and was a Finalist for Romance Writers of America’s RITA. Then she got lured over to the dark side—screenwriting. Her first script landed her an agent, director, stars—everything needed for the movie to get made but money. Later scripts [action comedies, romantic comedies, science fiction and fantasies] continued the string of “almosts” until the years 2000 and 2001, when she became the only screenwriter in history to be a Finalist twice with two different scripts in the competition to win a Nicholl Fellowship in Screenwriting. She received the Fellowship from the Academy of Motion Picture Arts & Sciences for an adaptation of her first published novel, La Desperada, under the title, “Redemption,” in 2001. Uncredited but paying work followed. 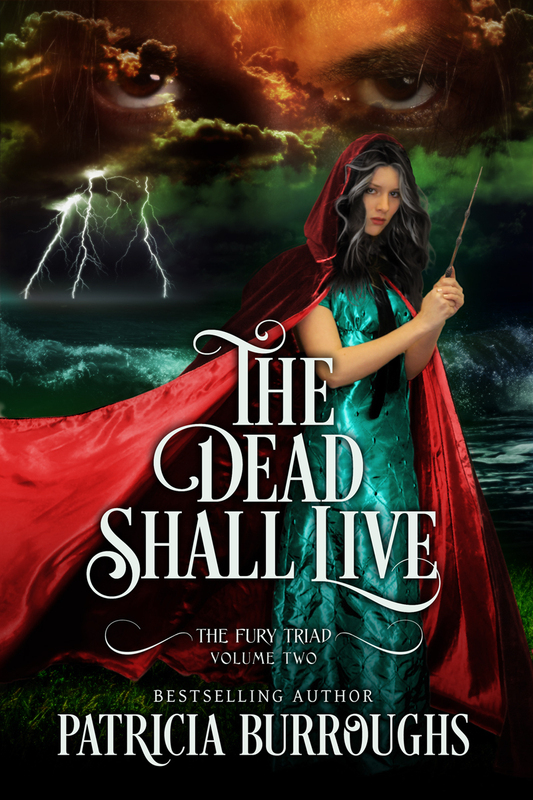 The award-winning The Fury Triad (Story Spring Publishing) marks her return to novels. Available in trade paperback or hardcover at these fine stores. Available as ebooks at these fine stores.